ANZAC Day - 25th April Dawn service at 6am at Civic Square (McLandress Square - Post Office Maryborough). ANZAC Parade - The 10.30am Service - Starts with a march along High Street to the Post Office. Please check later Council advertisements in The Maryborough Advertiser on details of all Shire locations. Two big weekends of art & inspiration nine towns - 21 venues. 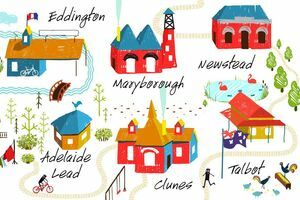 Meander your way through the Tiny Towns of the Central Goldfields region, enjoy creative, unique galleries, public spaces, cafes and surprises! The fourth annual Tiny Towns Art Trail this year spanning over four days. For full program follow on Facebook at Tiny Towns Art Trail or call into the Central Goldfields Visitor Information Centre. 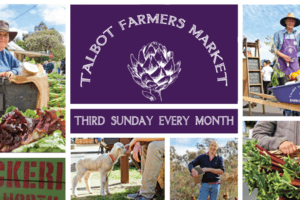 Experience this renowned bustling farmers’ market nestled amongst historical buildings and streetscapes.